There's not much I can say about this book's plot that its title doesn't already answer. In Sherlock Holmes & Kolchak: The Night Stalker, a certain pair of relatively well-known fictional detectives team up to crack the case and send everyone home happy. Of course, this isn't your usual pairing - by the time Kolchak is introduced to the situation, Holmes is long dead and so is the original client. It's only through the efforts of a particularly insistent (and lovely) young relative that he even agrees to open the case. But once the Night Stalker does dig in, he quickly realizes this isn't the kind of story that's easy to put back down. Interestingly enough, Holmes and Kolchak never meet face-to-face. I'm not even sure how that would've been possible, but it was a relief not to see any time machines or mysterious teleporting phone booths scattered throughout this issue. No, the two detectives communicate strictly via print. Holmes enlists the Night Stalker's help through an aged, century-old old journal that, as fate would have it, miraculously finds its way right into the modern detective's hands. 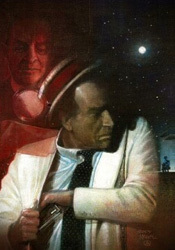 How the famed British sleuth knew this would be the case, or that Kolchak would even exist a full generation before his conception, are questions for another day. Carlos Magno and Andy Bennett split up the artwork chores, with Magno taking on the bulk of the work and Bennett filling in for a small scene at the story's onset. I wasn't particularly taken by either of them. Bennett's style is akin to a less-disciplined Michael Gaydos, uncomplicated and pedestrian, but also very dry. To his credit, there's only so much you can do with five pages of banter in a newsroom, but he certainly didn't liven things up much. Magno's work, which is set about a hundred years in the past, takes an era-appopriate Victorian slant that does a fine job in changing the setting. His artwork is more sophisticated, but likewise not especially dynamic. I'm not sure the story calls for anything more energetic, but this issue needs something more and that isn't being delivered by its artwork. This first issue is basically a Sherlock Holmes story with a small handful of Kolchak panels thrown in for good measure. That's neither a positive nor a negative; the detective work is enthralling and right in line with Holmes's other cases, but it does seem like it's missing a sense of balance. Maybe Gentile intended this to be more of an even split, then just got so caught up in the Holmes story that he lost track of time? That would explain a lot, particularly the issue's abrupt ending… regardless; it's a still fine story that could have benefited from a better artistic showing. Ultimately, it really depends on your opinion of the characters. If you're familiar with either and enjoyed their previous adventures, it's worth borrowing. If not, you might not like what you see.